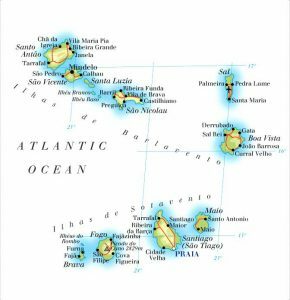 Cape Verde a collection of small volcanic islands way out in the Atlantic Ocean off the coast of Africa. If that sounds a lot like the Canary Islands, then the comparison is one the authorities in Cape Verde are in general happy to subscribe to, while pointing out that they’re actually rather like the Canaries were 40 years ago; that is, unspoilt. The 18 islands and islets were discovered in 1460, 450 miles off Senegal. Since gaining independence from Portugal in 1975, they have been attracting more and more tourists – mainly Italians and Portuguese, the population of 440,000 being boosted by some 200,000 holidaymakers each year. But this could be the tip of the iceberg, as the benefits of a Caribbean-like climate are boosted by house prices a fraction of both the Caribbean and the Canaries and, crucially for frequent flyers, just on hour’s time difference. Flights are at present via Lisbon and edge just over the six hour mark, but by November 2006 direct services will cut that significantly. Where else can you by and island apartment for under £50,000, with a young, friendly population, little crime, a temperature that settles at around the mid-20s Celsius all-year-round, endless opportunities for watersports, windsurfing and scuba diving, and capital appreciation as near a certainty as it can ever be? Property is mainly in the form of all-inclusive complexes with pools and kids’ facilities. Studio apartments are from just £60,000, up-market villa developments with private pool and roof terrace from around £300,000. Buy-to-lets are popular, but with such low-priced property, the investors have moved in before the bulk of British tourists have heard of the place, causing a possible over-supply – though it is hoped that this is merely a temporary situation. 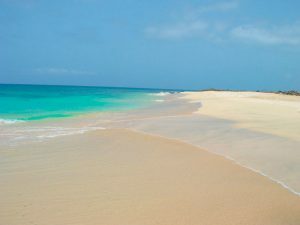 It is perhaps better to think of Cape Verde as an affordable bolt-hole, your own piece of Atlantic Africa.